This quilt block is considered to be a five patch, as it is made on a 5 by 5 grid. However, it is sewn together as an uneven nine patch. 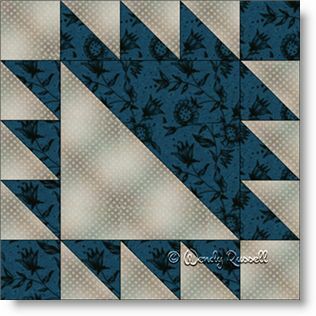 Since half square triangles are the only patches used in this quilt block, it is quite simple to assemble. Then it is just the use of your imagination to create a new heirloom quilt. I played around with the quilt layouts. You will see two additional pages in the pattern to illustrate this. In addition to the quilts shown here, which use a simple straight set and also a setting on point, I grouped four blocks together to make a "new" larger block, in two different ways and then illustrated quilts using those new blocks. The results are fun and interesting.